Sign up for Broadjam today to follow no greater sky, and be notified when they upload new stuff or update their news! no greater sky recently released their debut full-length record "HEARTS & STARS." Under the direction of industry veteran producer Mark Pay (Island/Def Jam recording artist Jon McLaughlin), Grammy Award winning engineer Ronnie Brookshire (Rob Thomas, Michael W. Smith, Steven Curtis Chapman, Whitney Houston, Boys II Men), and Grammy Award winning engineer Chad Evans (Gaither Vocal Band), no greater sky are set to make heads turn with this record. no greater sky is Curt Anderson (vocals, piano/keys, guitar, programming), Matt Lloyd (lead guitar, backing vocals), Nic Byron (bass), and Clark Hubbard (drums). 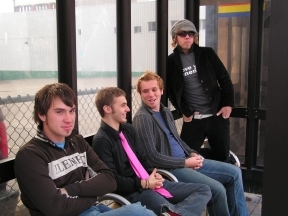 Since their beginning in 2001, the no greater sky boys have sought to give their listeners a passionate blend of musical creativity and pop/rock accessibility.